This is one of the most annoying error that you may probably face with your HT servers and they stop sending emails to MBX servers. There are multiple things that you need to go through to fix this problem. This post is just provide some common troubleshooting steps that can be performed if you face this problem. 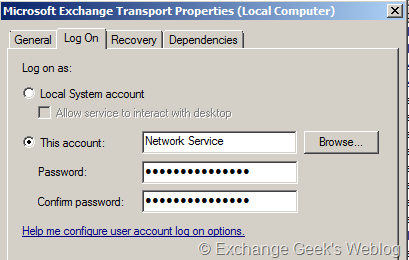 I faced this one toady in one of my customer’s Exchange 2007 SP2 environment. This error is most likely generated by permissions issue in active directory. The best bet to find out these problems is using ExBPA. In this particular case the permissions were messed up at the server object level in active directory. 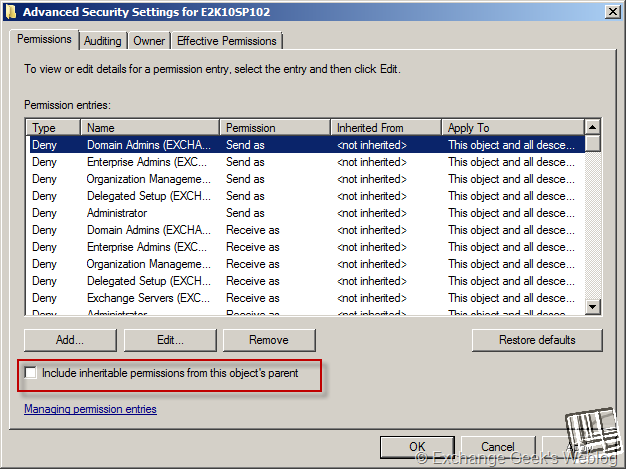 Inherited permissions from parent objects got removed due to some reasons. First off, make sure your active directory replication is not experiencing any problems. All domain controllers, global catalogs have the correct time and synchronized with your designated NTP server. You can use net time /set \\ntpservername if you find any issue discrepancies in the time. 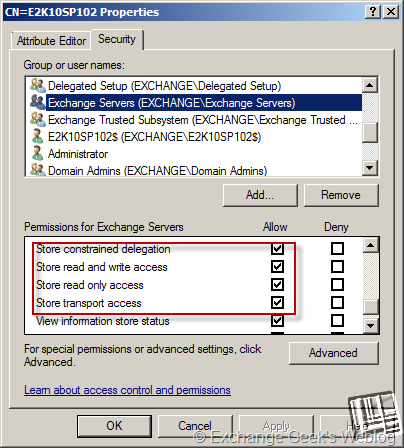 Computer Configuration\Windows Settings\Security Settings\Local Policies\User Rights Assignment of your default domain controller policies. Once you have made sure all these things are in place the permissions are something that we need to concentrate on. These permissions should be checked on all HT servers and MBX servers using ADSIEDIT and they must be as shown above. Force the replication across the site and make sure that all permissions are replicated to all the global catalogs in that site at least. This entry was posted on 06/05/2011 at 2:56 PM	and is filed under Exchange 2007, Exchange 2010. You can follow any responses to this entry through the RSS 2.0 feed. Both comments and pings are currently closed.